Firing a person from a project is a nasty thing. We tend to postpone the moment. We believe that people can change for good. Also, quite often we don’t do it consistently. People don’t clearly understand what they should expect from you. I think it should not be that difficult, personal or uncomfortable. If you have a flexible and transparent process people will have a chance to make amends. While you will have a professional way to fire a person without too many regrets. Today I’m going to share an action plan that will make the process straightforward and stress-free. Why can’t you avoid firing people? There is a conflict in leadership that you need to resolve. From one side, as a leader, you have to empower, develop and teach your team members. It feels right to help people with less experience, to give them a chance to show their potential. On the other side, you need to keep moving towards project objectives. You have to deliver your commitments. You can not tolerate low performers, slackers and incompatible people. They hurt the rest of the team. While the reasons might be different, it is still a negative effect. It means that someone will have to give some extra to cover up delays or poor quality. It may also mean that you will not be able to meet deadlines and fulfil your promises in time. Some people are way too negative. You know this kind of team members, they always have a reason why it won’t work. They have a direct impact on the motivation of others. Yes, it is different from the previous point. Some people are just demotivated by the current factors. So, quite often it is something that you can fix. But you need to be on a lookout for a pattern here. Your efforts may have a short term effect. If the person gets demotivated regularly and too often, it is more cost efficient to get rid of him or her. This case is usually a difficult one because often it is personal and emotional. And you cannot afford that. Some members just do not fit into the team. While it may seem like discrimination, you do need to consider age, cultural differences, and preferences of the whole group. When one person doesn’t have a shared vision in regards to the project work, it might be torture for all of them. The ultimate goal of firing someone is to ensure that the rest of the group can work better. There is one tool in project management that is underrated. 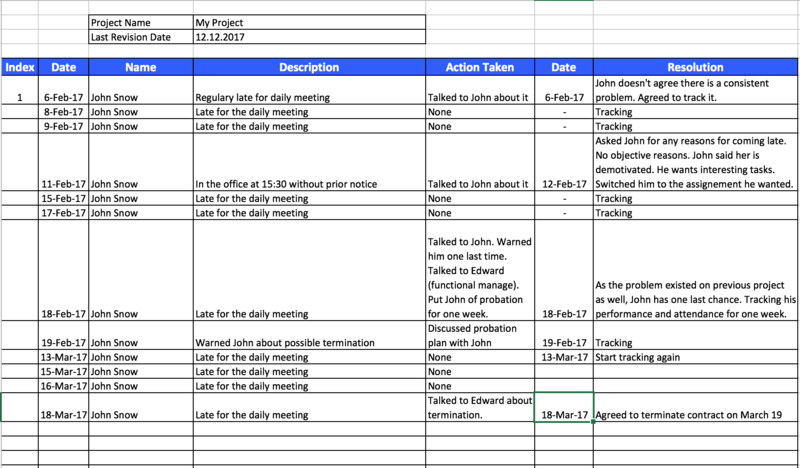 It is a document where you log all the information related to the conflicts on your project. You can get the Issue Log Template in the PM Basics library along with books and other valuable downloads. You might feel the resistance. It may seem like you are collecting dirty facts on your team. The goal of this document is to ensure that none of the conflicts is left unattended. Do YOU want to fire a person? It is the first question you need a clear answer to. Your attitude towards the person you need to fire will shape your next steps. I do hope that you will act professionally and ethically. You will detach yourself from emotional aspects and will weight in all pros and cons. And you will do that in regards to the benefits for the project as well as the team. In some cases, you can end it right here. If you do want to fire a person and you can do it at your sole discretion – do it. You can skip other steps and proceed directly to the “hard conversation”. I would not recommend doing that. Why? Several other options may save the day. Is it a valuable person? Do you work in an organisation of one project? If no, then quite possible the person you want to fire can bring value on another project. There are way too many factors that influence people. Poor performance or bad behaviour may go away in a different environment. Therefore, you need to consider to move a person to another project. Fire or transfer the person at once. Give him or her another chance. In any case, you should never skip the next step. No matter what you decided so far, you have to give the person a chance to explain himself. You may hear excuses or entirely reasonable arguments. It may or may not change your decision. You have to state that there is a problem directly. More importantly, you have to state that this problem is severe enough that you consider firing. I suggest you do it as directly as possible. Trying to show compassion, empathy or warp it into friendly tone won’t help you. It will send a wrong message. After all, you got to the point where you are ready to fire this person, didn’t you? So, do it as professionally as you can. Usually, at this point, you will understand whether the person is motivated to prove that you are wrong. Whether he or she wants to keep the job and make amends. In case you need approval from your management to fire or transfer a person, you need to get their buy-in on the approach you want to take. Your boss may have some additional input on the particular person. It might happen that this person has already a history of such probation periods. Likewise, there might be some objective circumstances related to this case. Entries from your Issues Log will be of value here. You will be able to prove the facts of the problem. Likewise, you can show that you already made efforts to resolve the problem proactively. Anyway, your management will have to act based on your input. Therefore, make sure you do comply with their requirements. Why is it the next step? Can’t I just go to my boss and demand to fire a person I want? If you don’t have direct authority to fire people, it means that every case should be proven. Your management will want you to demonstrate that it is not just your personal vendetta or subjective opinion. If you do want to give a person a chance, you have to measure your progress towards fixing the problem. At this moment you have to ensure that the team member agrees with the problem you have. Moreover, you need to come up with a mutual solution. The plan should be achievable, measurable and transparent. It can consist of several iterations. A step-by-step process that will show the progress. At each milestone, you will have to make a decision. Should we carry on to the next goal? Or should we let the person go? How long should this plan be? For behaviour and discipline issues, go for two or three iterations one week each. After that, you can extend to another month to see whether the results are stable. When you have a performance or competence issues, it will take longer. Usually, I take one month probation period. During this period a person should learn or master some essential knowledge or skills. Here is a pro tip. These plans should be written and confirmed. Write an email that states the conditions and terms. Then, let the person in question confirm that he or she agrees to these terms. There are two things I want you to keep in mind. You should never burn all the bridges. The employee you want to fire today may become a valuable asset in a year or two. Don’t lock the doors completely, leave the opportunity for the future. By this moment you have to be 100% sure. It is not a place for negotiations. If you are in doubt, consider to run or extend the probation. Don’t do it alone. Otherwise, it may seem personal and can quickly go rough. Take someone from HR department who can handle some aftermath talks. Short and up to the point. Hopefully, you have a direct discussion with the person about the reasons for termination. Therefore, state the reasons and the fact that you have already terminated the employment. Do not leave space for negotiation. There is no place for emotions from your side. You are on different sides of the barricade. There is no way you can feel and understand the emotions of that person. Whatever you say to show compassion will not sound sincere. Check out the chart on how to handle these reactions in “A Step-by-Step Guide to Firing Someone”. 4. When the bad news has settled in the mind of the employee, it is time to give some room to think it over. Personally, I don’t think it is a good idea for you to carry on the process. Let your HR colleague help the employee to collect his staff, explain the paperwork, how and when to receive the compensation. It will give that person some space and time. It will not feel like you are rushing him or her out. But there is the last step. 5. Do say goodbye. Catch a moment when the person is ready to leave the office to say goodbye and offer a handshake. Termination should not feel like bashing out. The person was not a 100% disaster, was he? Don’t leave them with that hollow feeling. Show some gratitude by devoting several last minutes of your precious time. But please don’t try to make it feel better. Just say goodbye. Is it done now? Nope. There are several things you need to do right away. Small talks will always follow the termination. You may be surprised to find out that a day after the whole department is dreaded that the company is going to bankrupt soon. They all will be fired. Makes no sense. However, coffee breaks can create a fancy version of any even. You need to make a clear statement why the employee was terminated and whether there is a trend in it. How much proprietary information is there on personal devices? Don’t leave it to chance. Think through all source, services and access the employee had. Close and terminated them all at once. By terminating an employee, you try to avoid risks. However, keep in mind that such risk response usually leads to new risks. Find a substitution and get the new person up to speed. Until then your project is still at risk. Liked article. I was part of project where key personal were terminated as they were not following company policy regarding sub contracting and relation with sub contract.. Termination time was at week, all belonging packed and were directed out of site under security and return ticked to head office for clearance and dues clearance. The action bring bad taste to some team members and lasted till end of project.